Signs of spring have slowly started showing themselves around us in the forest. There is a definite feeling that we have passed through the hardest weather and most challenging days. It seems that the children can feel this as well, and the spring energy can be seen in them too. Friendships that have been developing since September are becoming solid bonds. As the weather gets warmer, families are arranging play dates and enjoying the lighter days. During school time, children have requested we return to hand holding (which was abandoned when bulky mittens made it too hard), and hugs are exchanged on a daily basis. It is fun to watch this class grow closer and closer together – they really care for one another, and the absence of any individual is always noticed by the group. My heart sings when I see that these children who were strangers to each other a short 6 months ago, have become a community! Watching children who go from strangers with one another, to friends playing with one another, and then learning from one another, you know you’ve reached a pinnacle time of the year. It is pure magic to see children use advanced speaking skills to share their knowledge and understand ing of the world. From identifying young sprouts to explaining how to do hand-over-hand raising of a bucket, this group has really excelled in communicating and working as a team. And it comes when forest life is about to explode and each child’s previous experiences with Spring come to light. Whether from gardening, time spent outside just playing or doing activities, each child brings a wealth of experiences to our program. Without prompting, they will also share their skills on preparedness, safety and group cohesion with one another. They helped each with their backpacks and lunch containers consistently this past month. They reminded each other how to participate or showed each other how to be accommodating and work collaboratively with the group. With group cohesion so strong like this, we can slowly challenge ourselves and learn more, all the while finding more time for the observation and appreciation of nature. An act of learning in and of itself. I’m so grateful to all the families who have joined us in this journey so far. With Spring on the horizon I am excited to see where we’ll go from here! Our themes this month really flowed into each other quite seamlessly. 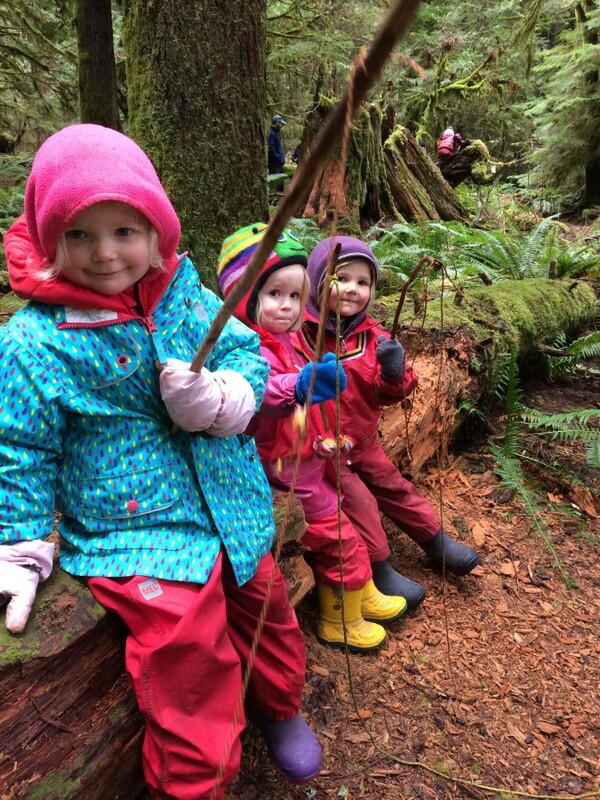 We started out with sticks, which are always incorporated into play in our classrooms, but at the pavilion they were used on a smaller scale. Many qualities were noticed – colour, length, thickness, and these observations were brought to the classroom as well. We used sticks to touch briefly on shapes, which led to our Valentine’s craft. The Valentine craft led to discussions about friendship, love and other emotions. Getting creative with sticks and play dough. The three dimensional art that resulted was truly fantastic. Sticks and glue – more creative fun! At the pavilion, we had been laying out sticks of many colours. While walking to our classroom one morning, the children noticed the same colours around them – red, yellow, green and brown sticks. 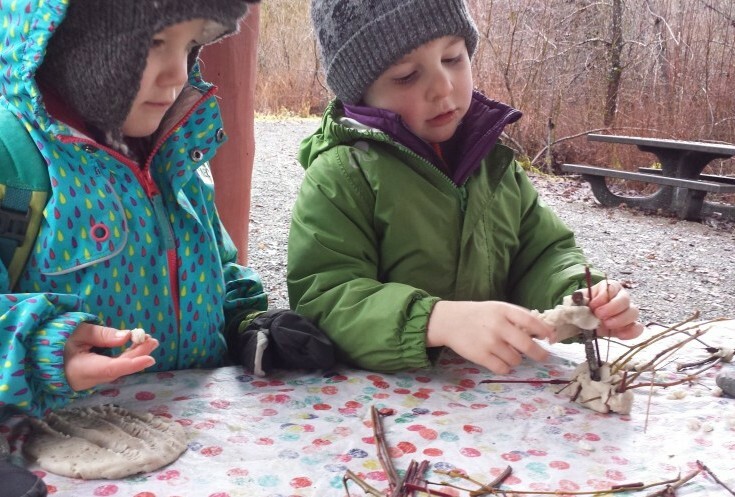 Using sticks, and other natural material, to create different faces, and to explore emotions. Choosing colours to express emotion – which colour is your happy? 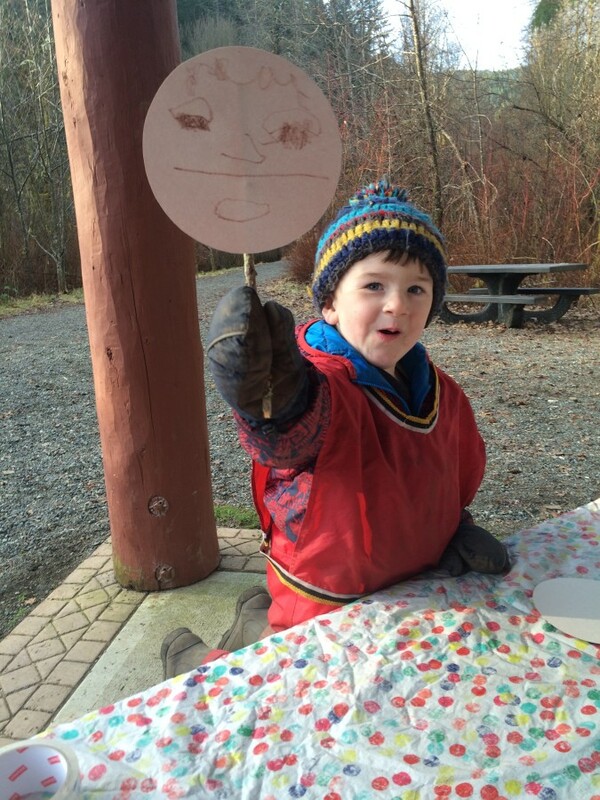 Here is a “serious” puppet – after weeks of exploring emotion, the children were able to recreate them on these puppets – paying special attention to the eyes, and mouth of the face. Another area that was explored a lot this month was climbing. The children continue to challenge themselves physically everyday, and are gaining so much more than just physical ability – their self-esteem and confidence are boosted, problem-solving skills honed, and sense of pride and accomplishment soar! Climbing a steep slope in the forest has little risk – the undergrowth is soft and spongy. Exploring new heights – under a teachers watchful eye! After trying, and trying, and trying again to climb the tree behind him, we asked Finnigan if there was anything we could do to make it easier. He decided this rope could be useful! Using the rope, we tied a “spiders web” for the children to climb under supervision. It was challenging, and even a bit scary as the ropes swayed a bit between the trees, but every child who tried proudly made it to the top!